The 25th and final flight for space shuttle Endeavour, STS-134 was also the 36th shuttle mission to the International Space Station. The 16-day mission delivered the Alpha Magnetic Spectrometer — a state-of-the-art cosmic ray particle physics detector to examine fundamental issues about matter and the origin and the structure of the universe — and the ExPRESS Logistics Carrier 3 (ELC3) carrying spare station components. The mission included four spacewalks, the final scheduled spacewalks by shuttle astronauts. Space shuttle Endeavour lifted off on May 16, 2011, at 8:56 a.m. EDT (1256 GMT) and landed June 1 at 2:34 a.m. (0634 GMT) on the penultimate flight in space shuttle history and the orbiter's last mission. Mark Kelly was commander of Endeavour's six-person STS-134 crew. Greg H. Johnson was pilot. Mission specialists were Mike Fincke, Drew Feustel, Greg Chamitoff and European Space Agency astronaut Roberto Vittori. The youngest of NASA's space shuttles has made its last landing. Space shuttle Endeavour touched down in Florida early on Wednesday morning, making its 25th and final landing to successfully complete a 16 day mission that delivered the last U.S. components for the International Space Station (ISS). STS-134 commander Mark Kelly piloted Endeavour to an safe arrival at 1:34:51 a.m. CDT (0634 GMT) on Runway 15 at NASA's Kennedy Space Center's (KSC) Shuttle Landing Facility in Florida. "Houston, Endeavour, wheels stop," announced Kelly. Endeavour's main gear touched down at 1:34:51 a.m. CDT, followed by the nose gear at 1:35:04 and wheels stop at 1:35:36 a.m.
"One hundred and twenty two million miles flown during 25 challenging space flights, your landing ends a vibrant legacy for this amazing vehicle that will long be remembered. Welcome home Endeavour," said capcom Barry "Butch" Wilmore from Mission Control. "Thank you, Houston," Kelly replied. "You know, the space shuttle is an amazing vehicle, to fly through the atmosphere, hit it at Mach 25, steer through the atmosphere like an airplane, land on a runway, it is really, really an incredible ship." "On behalf of my entire crew, I want to thank every person who's worked to get this mission going and every person who's worked on Endeavour. It's sad to see her land for the last time, but she really has a great legacy," said Kelly. Landing with Kelly were pilot Greg Johnson and mission specialists Mike Fincke, Andrew Feustel, Greg Chamitoff, and Roberto Vittori representing the European Space Agency (ESA). Their return saw the culmination of Endeavour's STS-134 mission, which added the Alpha Magnetic Spectrometer (AMS) and ExPRESS Logistics Carrier-3 (ELC3) to the station. During four spacewalks — the last to be conducted by space shuttle astronauts — Feustel, Fincke and Chamitoff installed Endeavour's robotic arm inspection boom on the exterior of the station to extend the reach of its own robotic arm. The astronauts also refilled the station's ammonia coolant system and greased one of the two wagon wheel-like gears that rotate the station's solar arrays. "We are very proud of Endeavour's legacy, and this penultimate flight of the space shuttle program once again demonstrated the amazing skill and dedication of our astronauts and the entire workforce," said NASA Administrator Charles Bolden in a statement. "As we begin the transition from the shuttle program to the commercial transportation of our crews and cargo, our ability to tackle big challenges remains steadfast and will ensure that NASA reaches even more destinations farther in the solar system." STS-134 completed 248 trips around the Earth in the course of 15 days, 17 hours, 38 minutes and 55 seconds while logging 6,510,221 miles. This was the 77th shuttle landing at Kennedy Space Center and the 18th to land there during the night. STS-134 marked the final flight for Endeavour, also known by its orbiter designation OV-105. The fifth of NASA's five space shuttle orbiters to fly, Endeavour has logged 299 days in space over the course of 4,671 orbits travelling 122,883,151 miles. Twin sonic booms heard over Florida, announcing Endeavour's final time arriving in the vicinity of the Kennedy Space Center. STS-134 commander Mark Kelly has now taken control of Endeavour to guide it through a 245-degree left overhead turn to align with Runway 15 for a 1:35 a.m. CDT touchdown in Florida. Endeavour is now flying a series of four steep banks, rolling as much as 80 degrees to one side or the other, to slow its approach. The first of these banks, at 1:08 a.m. CDT, rolled Endeavour 80 degrees to the left. Its first left-to-right turn will occur eight minutes later. This series of roll and roll-reversal commands gives the shuttle's ground track toward the landing site the appearance of an elongated "S," hence they are referred to as "S-turns." Space shuttle Endeavour, flying Mach 25 over the South Pacific Ocean with its nose tipped up and its wings level, encountered the first traces of the Earth's atmosphere, known as "entry interface," at 1:03 a.m. CDT at an altitude of 400,000 feet while still 4,800 miles from Kennedy Space Center. Commander Mark Kelly fired Endeavour's orbital maneuvering engines at 12:29:43 a.m. CDT for two minutes and 40 seconds, slowing the orbiter's velocity by about 200 miles per hour (295 fps), beginning his and his five crewmates' return to Earth. "Good burn Endeavour, no trim required," radioed Mission Control. Endeavour is on its way home after a successful final mission, its 16-day flight to deliver the Alpha Magnetic Spectrometer (AMS) and ExPRESS Logistics Carrier-3 (ELC3) to the International Space Station. 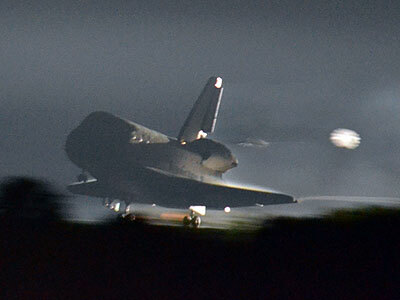 Landing on Runway 15 at the Shuttle Landing Facility in Florida is set for 1:35 a.m. CDT. Space shuttle Endeavour, flying its final mission, will be returning today to NASA's Kennedy Space Center in Florida. Flight controllers gave STS-134 mission commander Mark Kelly early word that he had a "go" to perform the deorbit burn that will initiate the shuttle's 25th and final journey back into the Earth's atmosphere. "Since the weather is shaping up nicely, we'll go ahead now and give you a go for the deorbit burn," radioed capcom Barry "Butch" Wilmore. "Copy, go for the deorbit burn," replied Kelly. Kelly will fire Endeavour's orbital maneuvering system (OMS) engines at 12:29:43 a.m. CDT, setting up a 1:35 a.m. touchdown on Runway 15 at the Shuttle Landing Facility. Space shuttle Endeavour's two 60-foot payload bay doors were closed at 9:48 p.m. CDT and STS-134 commander Mark Kelly, pilot Greg Johnson, and flight engineer Roberto Vittori began changing over the shuttle's flight controls from OPS-2, the software used they used for on-orbit operations, to OPS-3, used for reentry and landing, about five minutes later. The preparations are leading to Endeavour performing its deorbit burn at 12:29 a.m. Wednesday, setting up a 1:35 a.m. touchdown on Runway 15 at Kennedy Space Center's Shuttle Landing Facility. Weather is forecast "go" for landing. If the weather cooperates in Florida, space shuttle Endeavour will roll to its final wheel stop on NASA's Kennedy Space Center's Runway 15 early on Wednesday morning. 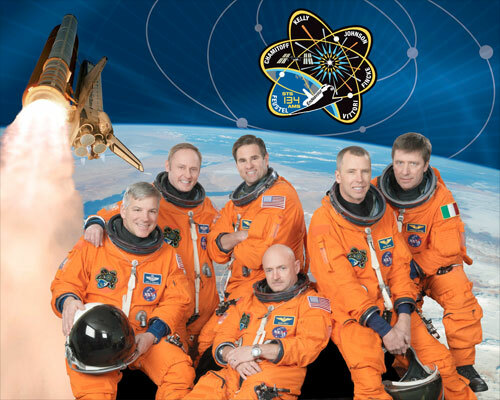 The STS-134 crew members woke for what is scheduled to be their last day in space at 4:56 p.m. CDT on Tuesday. Their wakeup song, "Sunrise Number 1," was the winner of the space shuttle program's original song contest. "It's good to spend one last part of a day in space. We're looking forward to getting home," radioed commander Mark Kelly. "Thanks for the wakeup song. There were a lot of submissions into that contest. That was the winner. It was really great," he added. More than a million votes were cast by the general public to choose two songs from among 10 finalists (out of the more than 1,300 entries) to be played to the astronauts. The crew is scheduled to begin deorbit preparations at 8:26 p.m. and close the doors to Endeavour's payload bay at 9:49 p.m. The crew will be getting into their orange launch and entry pressure suits at 11:06 p.m. and climbing into their seats at 11:29 p.m.
At 12:09 a.m. Wednesday, flight director Tony Ceccacci is scheduled to conduct his control team for a "go" or "no-go" for Endeavour's deorbit burn. Assuming he gets a "go," Endeavour's maneuvering engines will be fired for two minutes and 40 seconds beginning at 12:29 a.m.
That'll drop Endeavour back into Earth's atmosphere, setting up Kelly, pilot Greg Johnson and mission specialists Mike Fincke, Drew Feustel, Greg Chamitoff and Roberto Vittori for a 10:57 a.m. landing. At that point, space shuttle Endeavour will have spent a total of 299 days in space, over the course of 25 missions. It will have orbited the Earth 4,671 times and traveled more than 122 million miles. If needed, there is a second return opportunity to Kennedy at 3:11 a.m. It would require a deorbit burn at 2:06 a.m.
Endeavour is NASA's youngest orbiter. Built as a replacement for Challenger after its loss in 1986, Endeavour was assembled using spare parts prefabricated during the development of Discovery and Atlantis. The solid rocket boosters launching Endeavour's STS-134 mission were assembled from segments flown on 59 earlier space shuttle missions, including STS-49, Endeavour's 1992 maiden mission. Endeavour's three main engines have flown on 20 previous flights, including Endeavour's 2007 mission STS-118, which flew educator astronaut Barbara Morgan. The Alpha Magnetic Spectrometer, which Endeavour is launching and attaching to the space station, weighs about 15,000 pounds, uses over 2,000 watts of power, and has 600 microprocessors on board. The Alpha Magnetic Spectrometer involved the collaboration from more than 600 people in 56 institutions from 16 countries. Although the STS-134 crew are all veterans of spaceflight, this will be mission specialists Michael Fincke's and Roberto Vittori's first time riding onboard a shuttle. They are the last of the "rookies" for the 30-year space shuttle program. During STS-134, mission specialist Michael Fincke will break the record for the most time in space by a U.S. astronaut, surpassing current record-holder Peggy Whitson's 377 days. STS-134 commander Mark Kelly is married to Gabrielle Giffords, a congresswoman representing Arizona's eighth district. On Jan. 8, 2011, Giffords was the target of an assassination attempt and was shot in the head. For several weeks following the shooting, Kelly was replaced on the STS-134 crew by Frederick "CJ" Sturckow as he saw to his wife's recovery. Kelly and his crew mates wear blue "Peace-Love-Gabby" wristbands in support of Giffords. Over the course of 24 prior flights, Endeavour logged 116,372,930 miles orbiting the Earth 4,423 times in 283 days. This is Endeavour's 12th trip to the International Space Station. It also visited Russia's Mir space station once.